When you're out of inspiration and you need some ideas for elegant furniture for your home, lighting products, wall decor etc... then we want this space to provide an oasis. We strive to cover a variety of areas within interior design including best sofas, decorative accents, rugs, and simply ideas to make your home look the best. If you're looking for an elegant bachelors chest, door chest or drawer chest, then Thomasville carries some really nice options. These classic bachelors chests, door chests and drawer chests from Thomasville are made in premium wood and feature sleek and simple designs. Some of these chests have decorative carvings which certainly contributes a certain vintage theme, whereas some chests are very sleek and simple. Overall, Thomasville carries very elegant and simple designs which would work with most decors and homes. Their drawer chests and cabinets among other pieces are functional as well as stylish, and would be ideal for a bedroom or hallway for instance where you need additional storage space. So no matter what type of bedroom furniture pieces you're looking for, Thomasville is a great place to check out, as their selection is wide and their quality is great. "The Colorplay Door Chest offers a host of nooks—and looks—to keep your TV neatly tucked away or provide always-welcome closet space. Doors open all the way to reveal 3 shelves and 2 drawers, plus convenient electrical and cable connectors. Alter the svelte Zebrano veneer in Sassafras finish door inserts to suit your style with optional door panels in natural-looking seagrass, tailored woven charcoal, or playful, multi-colored dusty stripe." "The seductively shaped Paris Bombé Chest captures this high-flying lifestyle in your home: Its Patrician finish highlights painterly leather sides and leather drawer fronts. A “patchwork” dark Emperador marble top and solid brass hardware reinforce the elegant impression." "Spanish-style furniture often features interesting use of wood and leather. This handsome, Spanish-style four-drawer chest gets its rugged character from a combination of materials – mahogany framing with burnished leather insets on top, sides and drawer fronts, all of which are trimmed with antique brass nails." "When it comes to proportions, Felicity’s a perfect 10. Note how a gently recessed upper section keeps this generous-sized Chest feeling graceful and light—a welcome feature for a smaller bedroom in search of needed storage. A slim bead subtly outlines each of 7 drawers. Flamed brass pulls are accented with pen shell inserts—one of Felicity’s many divine details." 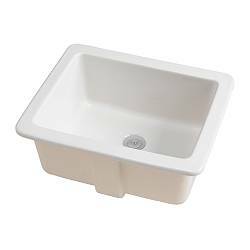 If you're looking to remodel your bathroom without spending too much money, then check out IKEA for bathroom sinks and faucets. 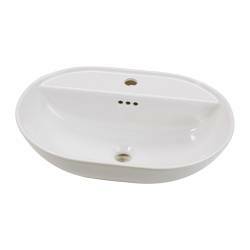 IKEA designs so many cheap, affordable bathroom furniture pieces such as bathroom cabinets, shelves and vanities. Here are a couple of bathroom sinks as well as bathroom faucets that are stylish, modern and contemporary without costing a fortune - perfect when you're remodeling on a budget. Strainer included. Suitable for HÖLLVIKEN and ASPSKÄR wash-basins. 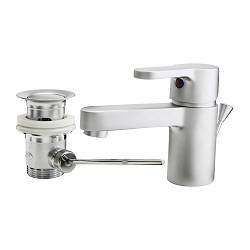 Fits ENSEN, ENSKÄR and APELSKÄR sink faucets. ORREVIK sink strainer is sold separately. ATLANT water-trap is sold separately. 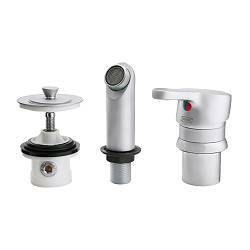 Fits ENSEN, ENSKÄR and APELSKÄR sink faucets. Ceramic, Colored glaze. To be used with ÅNN sink. Strainer included. If you're remodeling your kitchen, then Lowes is a good place to look. This home improvement store does in fact have a wide selection of kitchen cabinets in various wood types ranging from hickory, maple and oak, all quite basic in design but with different looks depending on which type of wood you choose. The prices at Lowes are affordable, so you might be able to purchase new kitchen cabinets for a low cost, and that is always a welcome thing! 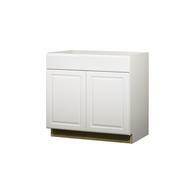 You can find sink base cabinets, and wall cabinets in different shades of wood and different sizes. With this selection, it would be pretty simple to put together a simple, good looking kitchen, for a minimal cost. 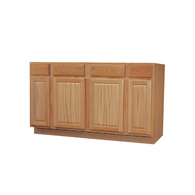 These Lowes kitchen cabinets feature solid construction and the interior is scratch resistant. Setting up a new kitchen can be a bit tricky: first make sure to measure your space accurately so you get a good perspective on what kind of cabinets you need. The staff over at Lowes also tend to be rather helpful so it would be a good idea to perhaps sit down with them for a more in depth consultation. "Doors feature solid oak frames and raised panel square veneer center panel. Cabinets feature heavy duty drawer boxes. 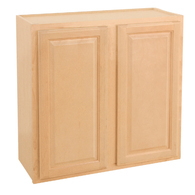 Cabinet interiors feature scratch resistant, easy to clean finish"
"Fully assembled tall utility cabinet with solid oak face frame construction. 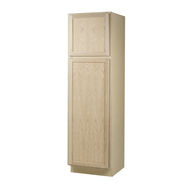 Cabinet door features a solid oak frame and a square flat oak center panel"
"Doors feature white thermofoil finish and raised panel square profile"
"Cabinet Material: Maple, Quality furniture grade finish. Solid hardwood face frame for added strength"